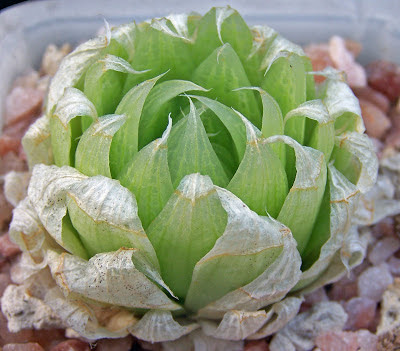 No longer accepted by most as a separate variety, it nevertheless is one of the most beautiful forms of A. ornatum, with its heavy white flecking and yellow spines. It can take a fair amount of cold (-10C) if dry during the dormant winter season. The form name is often misspelled as mirabellii, but it derives from the very old description Echinocactus mirbelii (Astrophytum ornatum v. mirbelii) LEMAIRE, CH. (1838). My apologies for not posting much this month. There were just too many things which got in the way. But nothing is going to get in the way of celebrating Christmas. Our granddaughter who lives in California, will be with us, flying in tomorrow. I'll be leading the Christmas Eve service at Woodlawn United Methodist tomorrow night and then the family will be together for Christmas. On the 30th, I'll be leading worship with a baptism and receiving a couple of new members, preaching on new beginnings. ...and I'm retired! I send to all of you the very best of Christmas. If you are a praying person, please include the all too many victims of gun violence around the world and pray for politicians and ordinary people willing to take risks for peace with justice. Peace to you all! 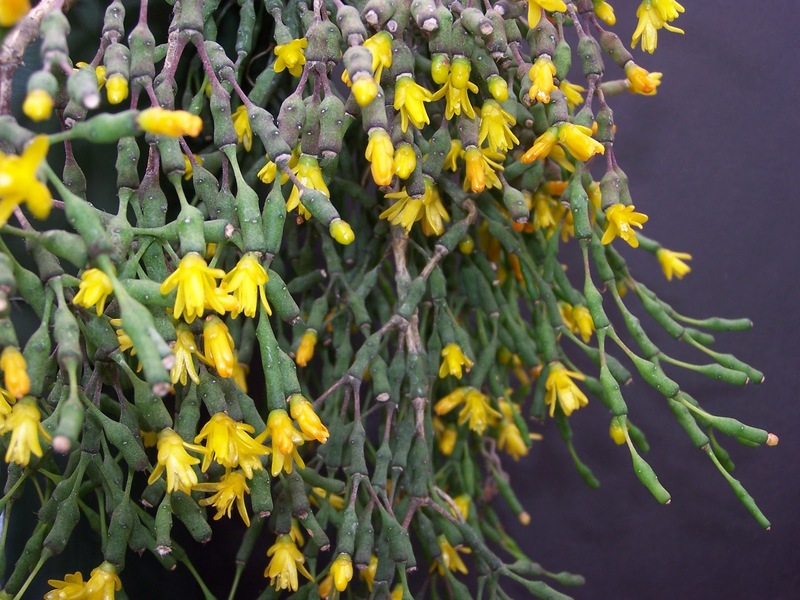 A great hanging basket cactus, Hatiora salicornioides, AKA "Drunkard's Dream", is easy to grow and flowers dependably. A jungle cactus, it needs more water than desert cacti, but nevertheless likes good drainage. The horrible events which unfolded at Clackamas Town Center here in Oregon yesterday (about 19 miles from us, across metropolitan Portland) have caught the attention of some of the news media. It's hard to understand these kinds of things, but our prayers are with the families of the dead and with the 15 year old girl recovering from gunshot wounds at Oregon Health and Science University Hospital. A friend of ours works at Barnes and Noble and helped get some of the customers to safety. The police did a commendable job (they were on the scene in less than two minutes) and many people stepped forward to help people get to safety. A local announcement: The December meeting of the OCSS is the Holiday Party being held this coming Saturday, December 15 at 2 pm. Location? - 7875 Blinkhorn Way, Gladstone, OR. Directions are a little complicated: Take I-5 south toward Salem. At exit 288, take the ramp right for I-205 toward Oregon City/West Linn. At exit 11, take the ramp right toward DMV/Gladstone and turn right onto 82nd Dr. Go about 1/2 mile, passing Ruhl's Honey, a spa place and a furniture consignment shop. Take a left on Strawberry Lane, which crosses back over the freeway. Strawberry is a small street and is hard to see. There is a turn lane and look for a low wall built by "The Wall" company on the NW corner where you turn. Take the left onto SE strawberry Ln. Go about 1/2 mile. Watch for "yellow, curve in the road, speed sign" which tells you to be on the lookout for SE Stanhelma Dr. and turn left. (If you pass a small park on the right or if you reach Webster, you have missed the turn to Stanhelma.) Go up the hill, bearing right. Turn right onto Blinkhorn Way. Destination is on the right side, a low, brown house, paver driveway, and a Pacific Northwest salmon on the door. Questions? Call 503-655-7038 or 503-913-7123. The society will provide baked ham and non-alcoholic drinks (if you wish to bring wine, that's OK). The rest of the meal is potluck. Hope to see you there. 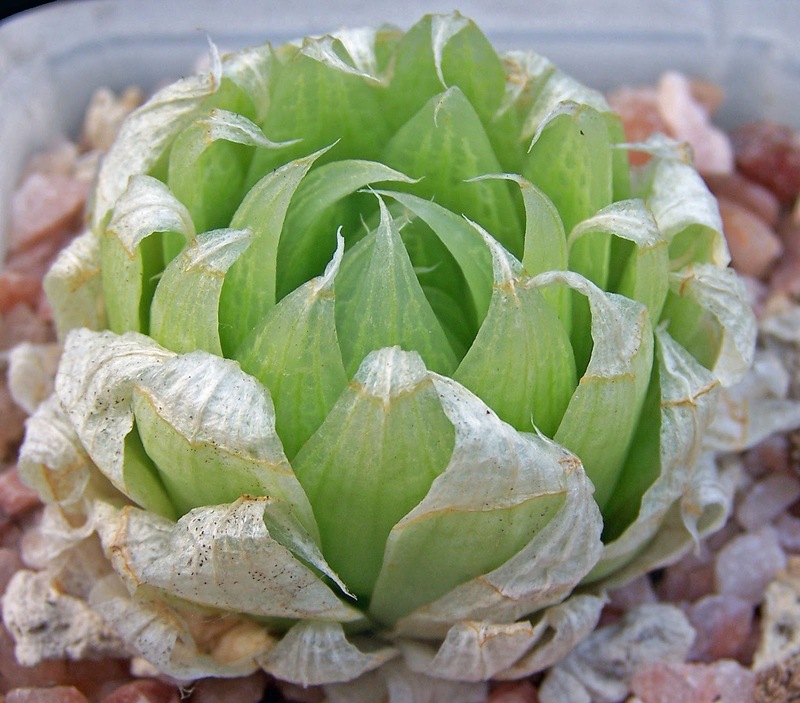 Grown from seed from the Flomskraal Dam area in South Africa, we only have a limited number of these. We've been nursing them back to health following an accident in which most of the plants were damaged. 'Pink Blush' is understandably one of the most popular of the Kelly Griffin hybrids. Quite easy to grow and get to flourish, it just keeps getting more and more impressive as it ages. Hanging down among all the Rhipsalis branches are a couple of stray "Twiggy"s (Cynanchum marnierianum). Hanging baskets aren't our "thing", but they take over the "first impressions" in the greenhouses at this time of year. It's been a little hectic lately, but it should be getting back to somewhere approaching normal pretty soon. 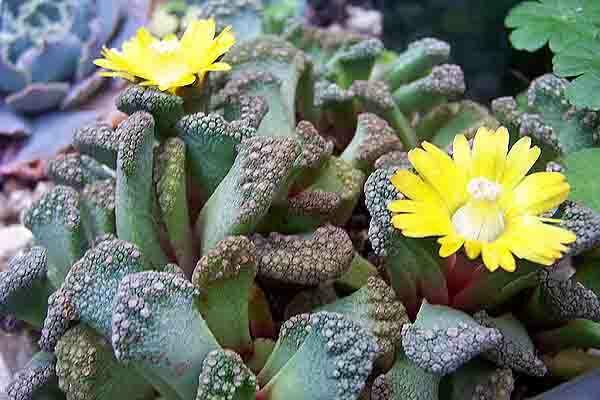 In the meanwhile, a photo from the past, Titanopsis calcaria. It's flowering now, but I just haven't had time to get out there lately when the light's right.